When it comes to the bouquet and boutonniere, there aren't any rules. You can go with blooms that match your color scheme, or no blooms at all (like paper or broach bouquets). Succulents are always a popular choice since they add a natural, unique-looking texture, or a sprig of berries can also be a fun alternative to fresh blooms. Go for a style that matches your personality and you can't go wrong. Check out some of the most unique boutonnieres we've ever seen to help inspire your own. Little superhero Lego figurines are small enough not to be distracting but speak volumes to the groom's personality. 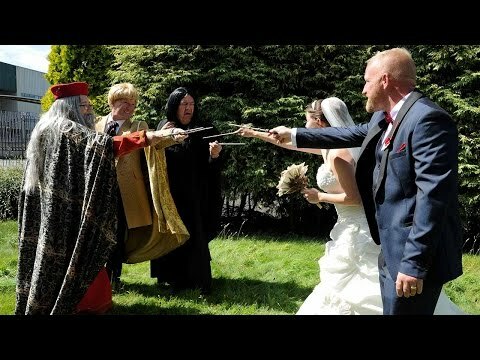 This is a great way to infuse personalization into the ceremony (and his attire). With brooch bouquets on the rise, it was only a matter of time before they made their way over to fellas' attire too. Pin a brooch or felt flower on his lapel. Replace a traditional floral pin with a fun button, like this mini hand-drawn picture of a beloved pet. He'll love that it's both practical and personal. Adding just a hint of gold turns a regular boutonniere into a one-of-a-kind accessory. Spray-paint heartier floral elements, like leaves and seeds, for a pop of metallic. If the groom is a sports enthusiast, incorporate his favorite pastime in his bout. Get creative with red string for baseball, orange roses for basketball or add some tees to the seasoned golfer's lapel. Rustic wedding theme? Wrap the boutonniere in twine to give it a bit of texture and charm. If you're having a destination or oceanside wedding, choose a bout add-in that speaks to your location. Keeping the color relatively neutral or tucking it behind a few small flowers is enough to let it be noticed, but doesn't overwhelm the lapel. Not a flower kind of guy? No worries. You don't have to have a single petal on that bout if you don't want to. Look to greenery, berries or fiddlehead ferns for a unique alternative. Pay homage to a favorite craft brew with a few hops, barley and beer bottle cap. A small arrangement of lavender with seeded eucalyptus looks minimal and sophisticated at the same time. For a nautical wedding, a great flower alternative is a small knot. It goes perfectly with the theme while also acting as a symbol for your relationship. A Darth Vader Lego figure? Go for it. The metallic casing looks modern, while lending a bit of masculinity to the lapel. Wearing a family heirloom on the wedding day is a sweet tradition that holds high sentimental value. Have your groom pin a treasured object on his lapel for all to admire.